Note: a goodly number (like: all) of these photos date from the post-merger era. 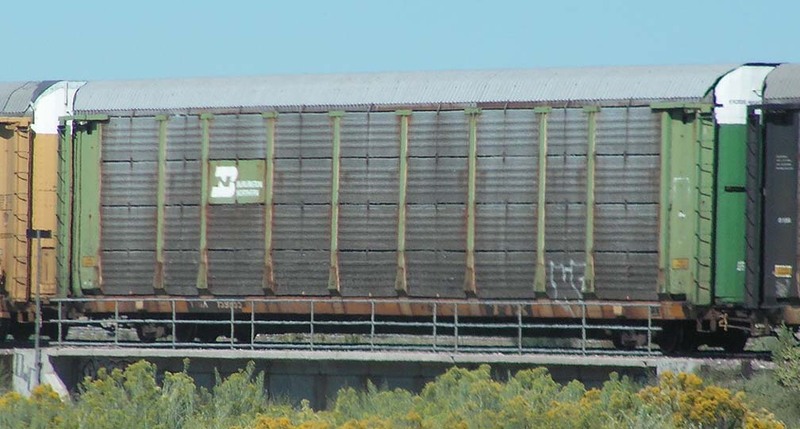 Tri-level autorack, part of number obscured (on ETTX 810×68), rolling through Las Cruces on 11/12/2011. Sorry about the clutter; I was trapped in traffic. The car is in remarkably good condition, despite the graffiti. 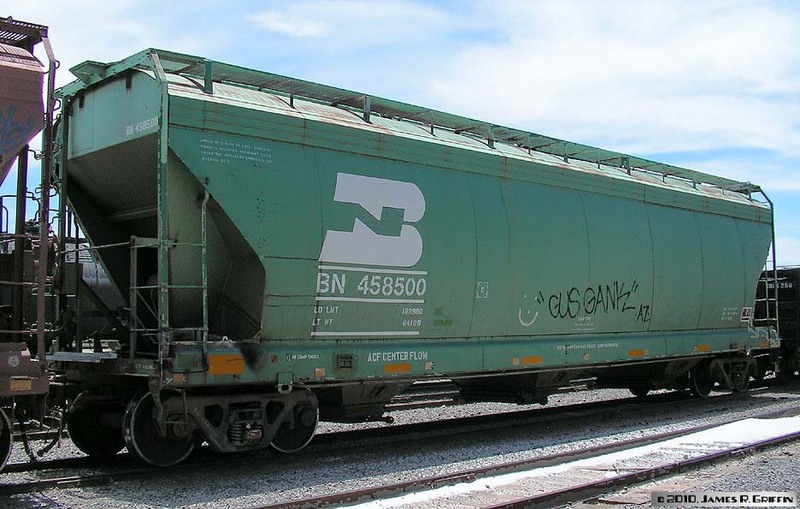 BN tri-level auto rack, riding on ETTX flatcar 905108. It’s on a westbound BNSF train near Scholle, NM in July 2002. BN bi-level auto rack, on TTGX flat 962552. 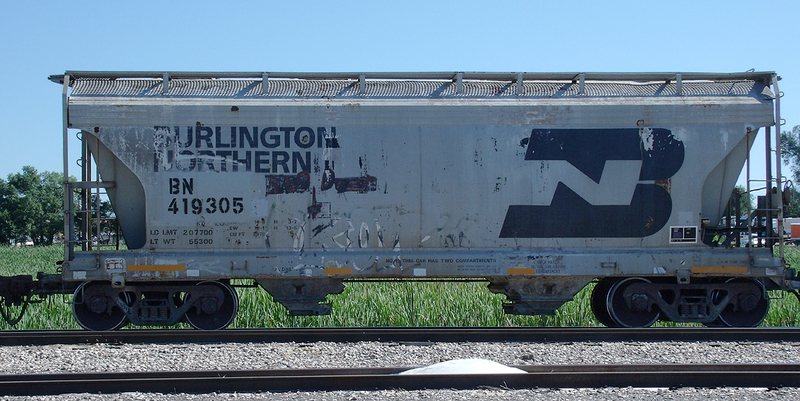 It’s westbound at Belen on 10/30/2009, showing its age a bit (note that the BN logo is nearly rusted off the nameboard). BN autorack on TTGX 159855, westbound near Gallup on 9/11/2010. Good to see it still in service 15 years after the merger. 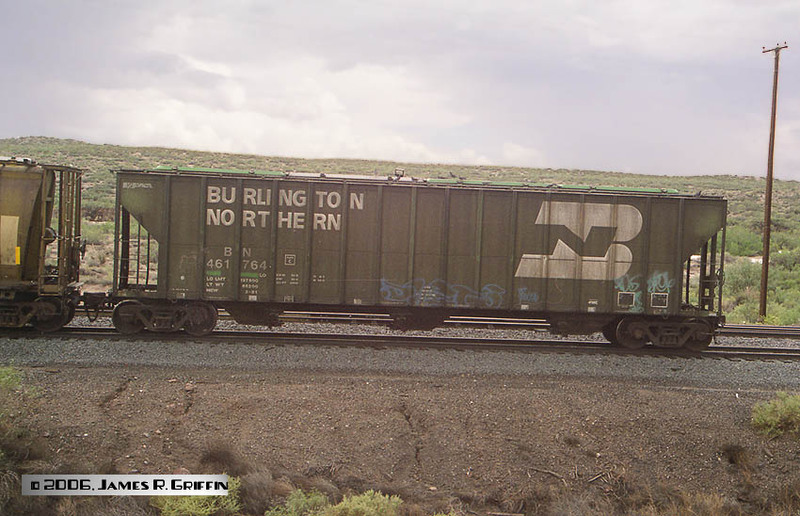 BN autorack on what looks like TTGX 893424, westbound near Gallup on 9/11/2010. This rack no longer carries the owner placard, but I was able to confirm the BN reporting mark on the end panel. 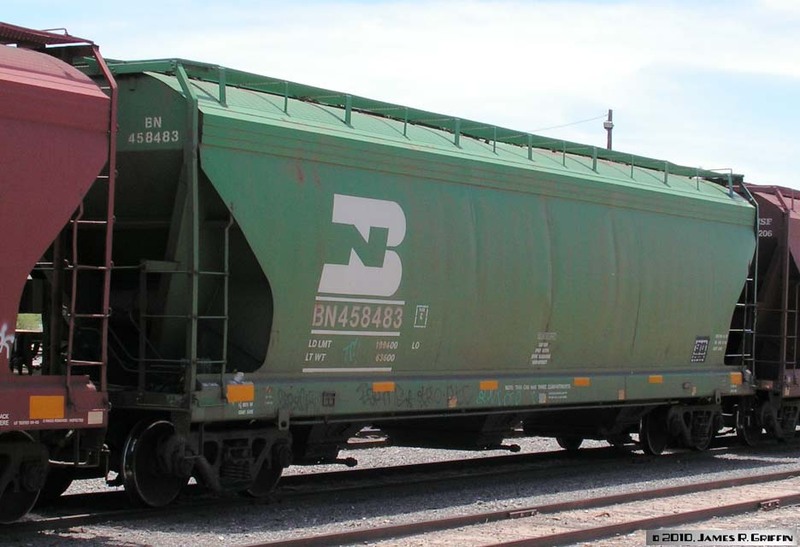 4750 cu ft covered hopper 448528, at Rincon on 5/06/2016. 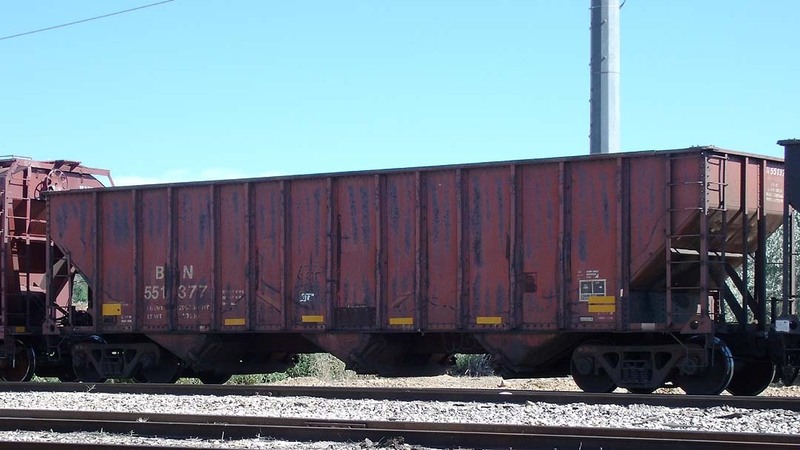 4750 cu ft covered hopper 449246, at Rincon on 5/06/2016. 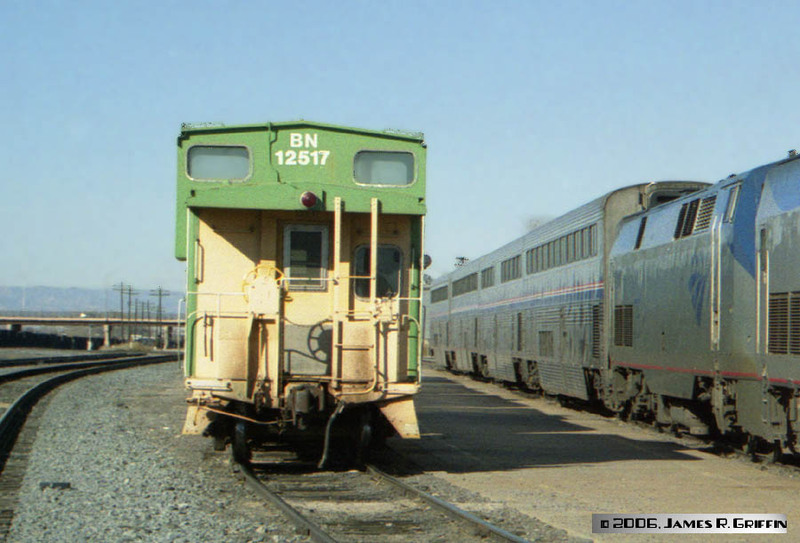 Built 1/1980 by Pullman Standard. 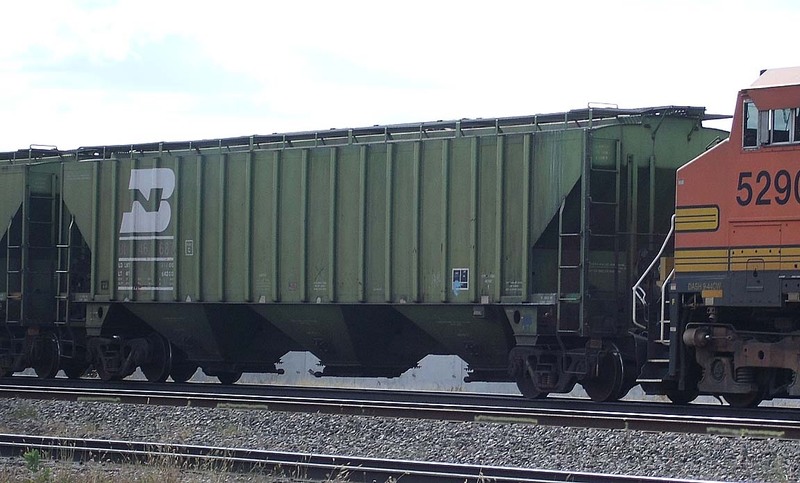 ACF 3-bay covered hopper No. 458483, seen at Rincon, NM on 5/08/2010. 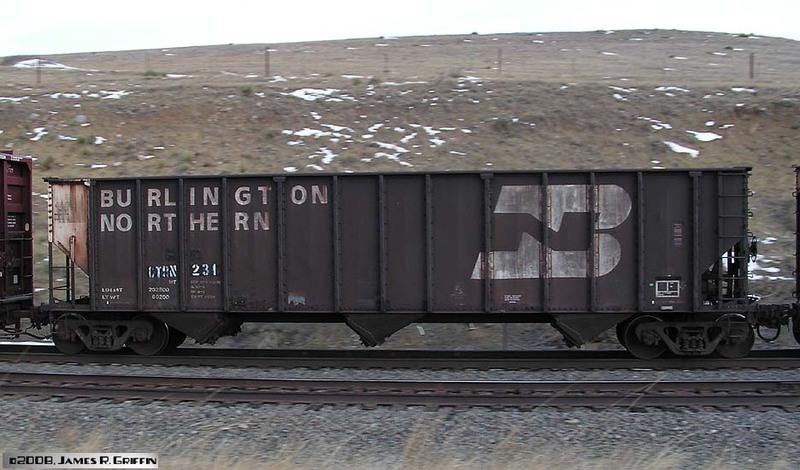 ACF 3-bay covered hopper No. 458500, seen at Rincon, NM on 5/08/2010. 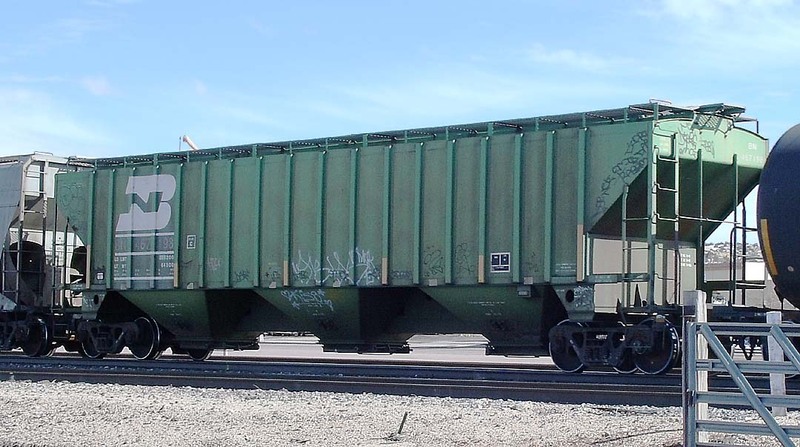 ACF 100-ton 2-bay covered hopper No. 419305, in the yard at Longmont, CO on 7/31/2011. Showing its age but still serving in its original colors. 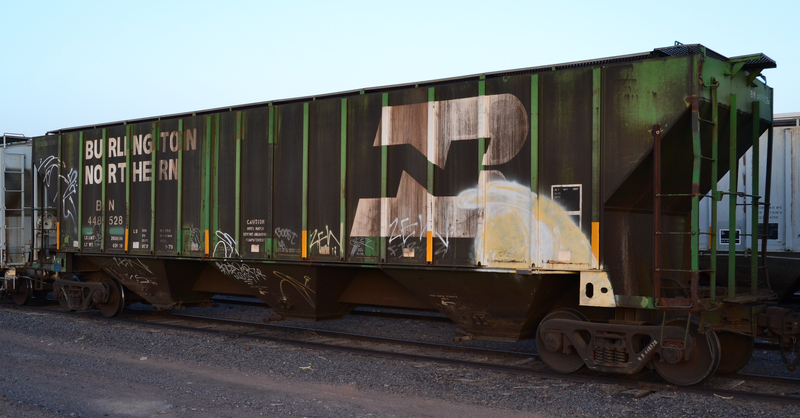 Covered hopper 461168, at Rincon on 7/28/2014. Built 5/1980 by FMC . 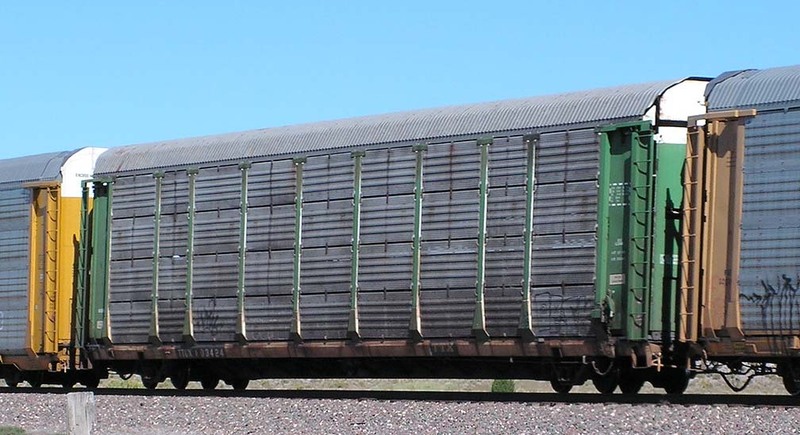 Covered hopper car No. 461764, parked at the SWRR interchange in Rincon, NM on 8/15/2006. It’s showing the grime from many years of service. 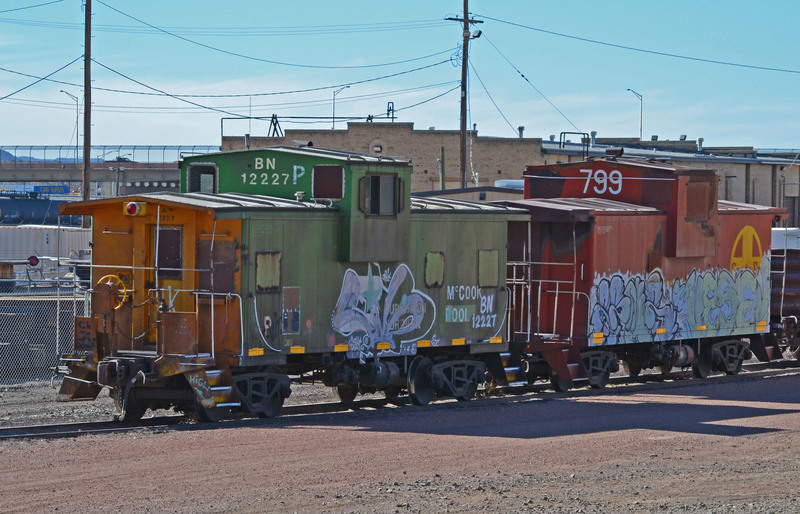 Three BN covered hoppers wait in the interchange yard at Rincon, NM on 2/19/2007. The car on the right matches the middle one in construction, but matches the left-hand car (# 460922) in lettering scheme. It was nice to find three green cars still in BN paint together in one place in 2007. 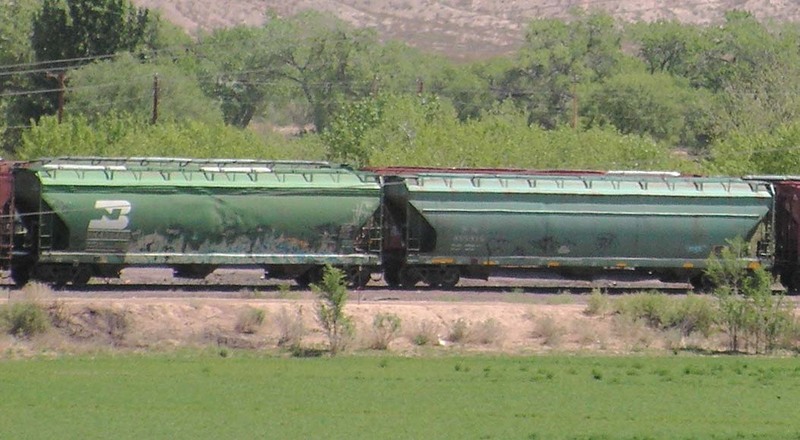 A pair of ACF covered hoppers are spotted at Socorro, NM. These cars are in perlite service at time of the photo (4/29/2009). Note the stiffener rib on the longer car on the right. 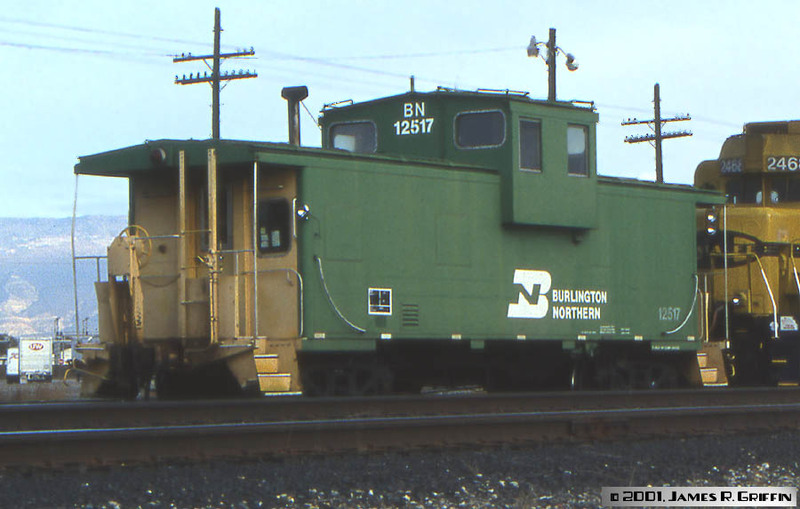 BN covered hopper 462397, built by Pullman-Standard. Spotted on an ag spur at Mesilla Park, NM (Las Cruces) on 12/12/2009. Covered hopper 467198, seen leaving Gallup on 2/21/2011. 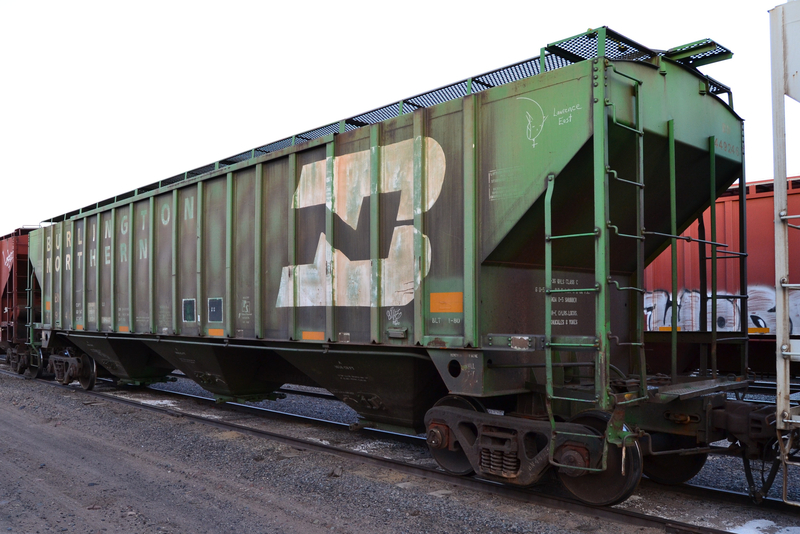 Covered hopper 467687, seen in Ruthton, MN on 9/29/2011. BN had a huge fleet of highway trailers, in various lettering schemes. 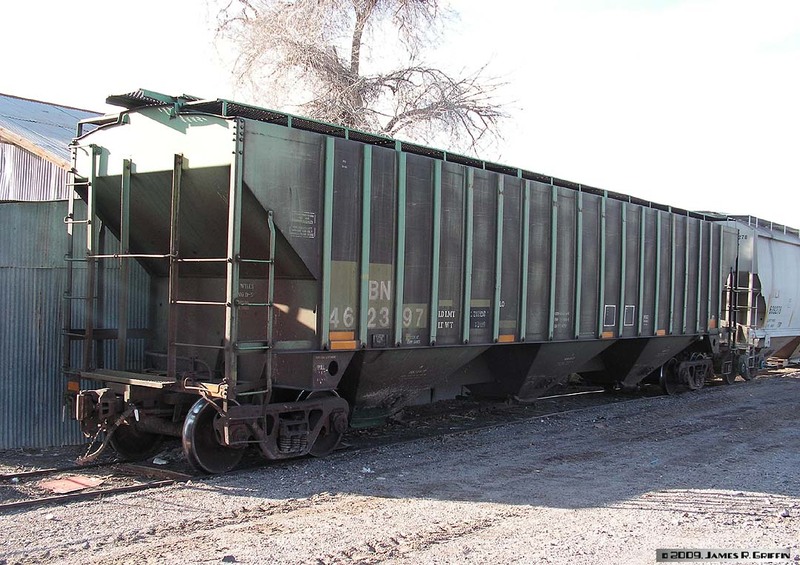 One such 45′ trailer in a basic scheme was in the Rincon yard on 2/19/2007. 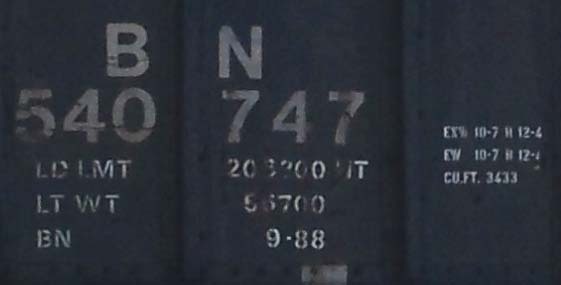 The number placard reads BN0 467. 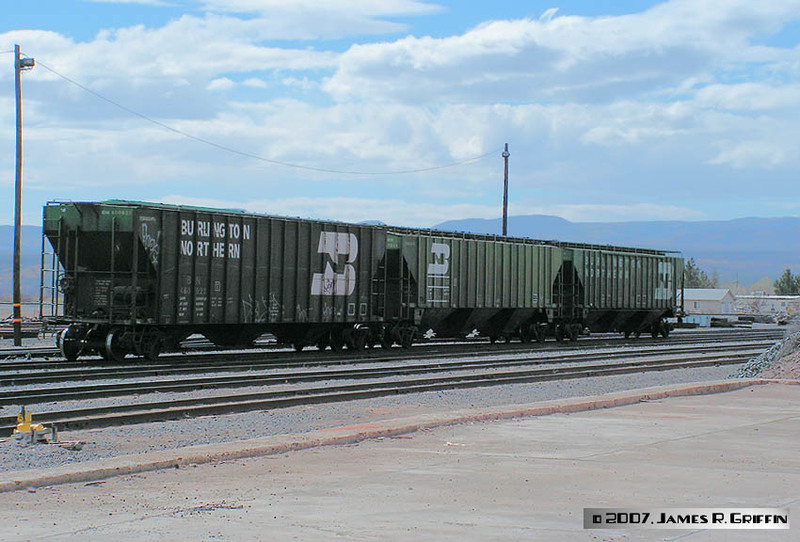 100-ton triple hopper 533157, spotted in Gallup on 4/22/2012. It’s been re-lettered, possibly renumbered at some point. Or maybe the paint was simply damaged. Note the diamond pressed panels between each rib. 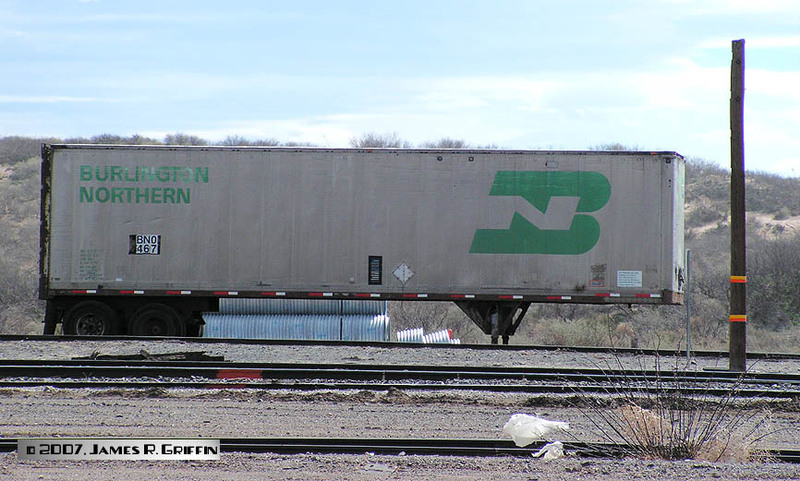 One of the many… a 100-ton triple hopper, now wearing CTRN reporting marks, spotted at Rocky, CO on 12/06/2008. 100-ton triple hopper 540747, in Longmont on 7/31/2011. Here’s a close-up of the data stencils. 100-ton triple hopper 541045, in Longmont on 7/31/2011. 100-ton triple hopper 551377, painted oxide red, in Longmont on 7/31/2011.